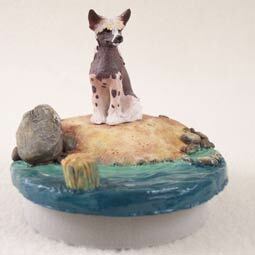 Chinese Crested Dog Candle Topper Tiny One "A Day on the Beach"
Home > Dogs All > Chinese Crested > Chinese Crested Dog Candle Topper Tiny One "A Day on the Beach"
The Chinese Crested is believed to have originated on the ships of Chinese mariners, who sailed with the dog to hunt vermin on board. There is thought to be some African hairless dogs in their genes, causing one of the two varieties we know today. The Hairless variety has soft, silky hair on its head (crest), tail (plume), and feet (socks). The skin of this variety is soft and smooth and must be protected from the weather and sunburn. The Powder-puff variety is entirely covered with a double soft, straight coat that can be any color or combination of colors. In fact, there could be each variety in a single litter of puppies, and they are shown together. The AKC recognized the Chinese Crested, in the Toy Group, in 1991 and has put the breed on the list of breeds best suited for people with allergies as they barely shed whatsoever. This breed’s ideal size is 11 to 13 inches tall at the withers and makes an excellent companion as they crave human interaction.